Yes, we said that right. A sinkhole! Mihal hit his drive down the 14th fairway at Annbriar, and upon driving up to the ball, he and the group he was with notice an odd depression. But to a golfer this is no unusual occurrence, what with the undulation that is scattered across many of the golf course in the world. As Mihal went over by his ball, that was all she wrote, and the very ground beneath him disappeared, with the golfer falingl about 20 feet down into a hole that had just opened up in the earth. How about that story that you can tell you friends? Mihal was fine, though did suffer a minor separation of his shoulder from the fall and resulting impact. And with the recent story in Florida of a man who has never been found after a sinkhole opened up underneath his bedroom went nationwide last week, Mihal counts himself lucky that nothing more happened. The real shame here is that Mihal, a 6-handicapper, was just 1-over par on his round through 13 holes. he was stringing together quite an impressive round before falling in! 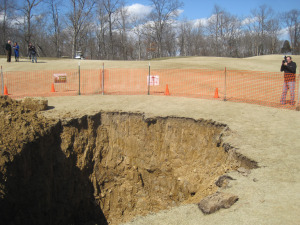 He was about 100 yards out on the Par-5, waiting to hit his approach shot to the green when he took notice of the impending sinkhole. No bigger than the size of a bathtub Mihal described, the ground simply gave way immediately after walking on it. Asked if he plans to return to Annbriar Golf Club to play anytime soon? As the PGA Tour moves to Copperhead at Innisbrook Resort in Florida this week for the Tampa Bay Championship, we can only hope that the grounds keepers take notice. Of course, players might fall into water if anything, with the Palm Harbor area so close to sea level.